This page is for a Rams Super Bowl LIII Commemorative Football and a deluxe football display case. The display case and football will ship separately. The Los Angeles Rams are headed to Super Bowl LIII! After a dominant regular season which saw them claim the #2 seed in the NFC, the Rams beat the Cowboys and then went on the road to beat the Saints to claim just their 2nd NFC Championship while playing in LA. 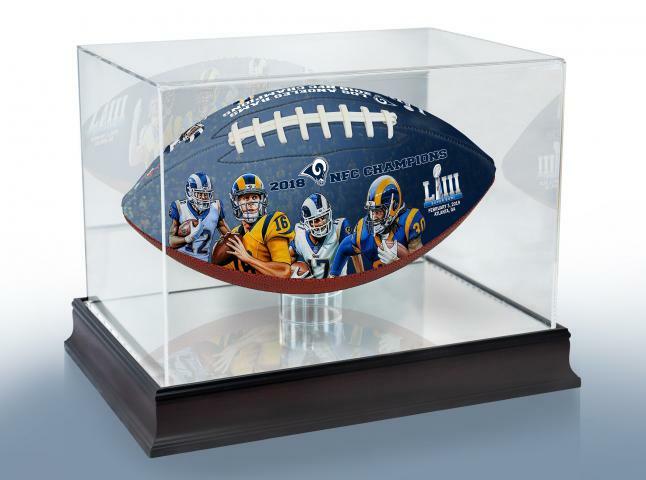 To celebrate this historic event, we are proud to release this full-size, officially licensed, Rams Super Bowl LIII Art Football. The ball features the Super Bowl LIII logo, date and location of the game, and features original reproduced artwork by the Big Time Bats Art Studio. One panel of the football depicts the Rams’ offensive stars: Brandin Cooks, Jared Goff, Robert Woods, and Todd Gurley II. The opposite panel features the Rams’ defensive stars: John Johnson III, Ndamukong Suh, Aaron Donald, and Cory Littleton.